Image: Trump stands with Kansas Secretary of State KobachDonald Trump stands with Kansas Secretary of State Kris Kobach before their meeting at Trump National Golf Club in Bedminster, New Jersey on Nov. 20, 2016. Kansas Secretary of State Kris Kobach, a Republican endorsed by President Donald Trump, was narrowly leading incumbent GOP Gov. Jeff Colyer by about 1,300 votes in Tuesday's gubernatorial primary. Kobach had 41 percent, or 91,880 votes, and Colyer had 40 percent, or 90,565 votes, with 70 percent of precincts reporting. Kobach, an immigration hardliner and proponent of widespread illegal voting, served as vice chairman of Trump's vote fraud commission until it was disbanded earlier this year after failing to find any evidence of large-scale fraud. [post_ads]Trump endorsed Kobach in a tweet on Monday, calling him a "fantastic guy who loves his State and our Country" and is "Strong on Crime, Border & Military." Republican party officials had reportedly lobbied Trump not to put his finger on the scale in the race because they believe that Kobach's polarizing views could bolster Democratic turnout in the November election. Colyer, who served as lieutenant governor for seven years, became governor earlier this year after Sam Brownback resigned to become a U.S. ambassador. The Democrats also had a crowded primary, with five candidates, although Kansas is a red state that Trump won in 2016 with 56 percent of the vote. Kobach has advised the president on immigration and election issues in the past and was an early supporter of the president's campaign. As the leader of the vote fraud commission, his efforts ignited fierce backlash from both parties and never presented any evidence to support the president's claim that widespread illegal voting occurred during the 2016 election. 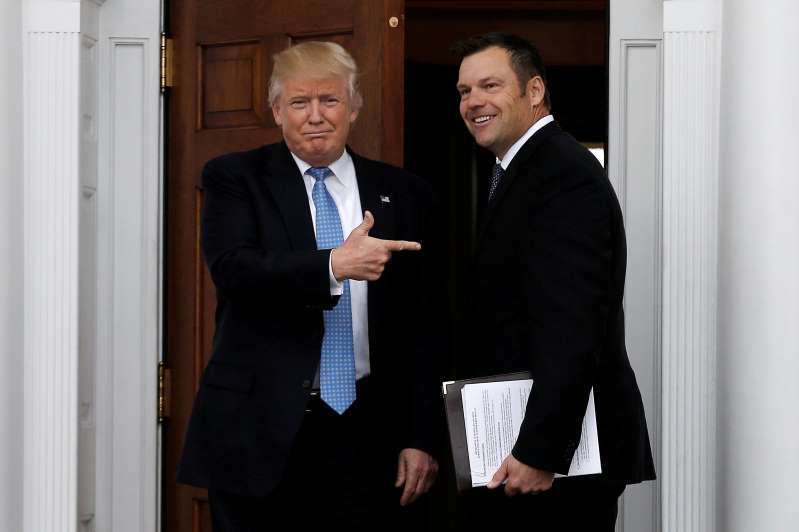 Kobach's views on immigration, voter ID requirements and unsubstantiated claims about illegal voting have repeatedly drawn the ire of civil liberty groups, such as the ACLU, and liberal lawmakers. He previously held a local Kansas city council seat and had failed in previous bids for a state senate seat and congressional. Kobach, who has called himself "the ACLU's worst nightmare," ramped up anti-fraud efforts when he became secretary of state in 2010, becoming deputized in 2015 to prosecute alleged voter fraud. But he has had nine convictions — a point critics say is evidence of Kobach overstating the extent of fraud. He once said that undocumented immigrants would "self-deport" once government benefits "dry up." He also helped craft a policy shortly after 9/11 that required men from 24 Muslim-majority countries and North Korea to report to U.S. government offices to be fingerprinted, photographed and questioned. Subsequently, 83,000 did and the government moved to deport 13,740. During the race, Colyer attacked Kobach's record on abortion by pointing to a 2000 local newspaper questionnaire, in which Kobach described his views on abortion as pro-choice when he ran for state Senate, according to The Kansas City Star. Kobach later said he had never been pro-choice, the paper reported. Colyer also criticized Kobach for his recent court defeat in trying to defend Kansas' proof-of-citizenship voter law. A federal judge found the law unconstitutional, ordered Kobach to pay $26,000 in contempt fines and rebuked him for misleading the court.